Home Investment Retirement How Many Americans Have Nothing Saved for Retirement? How Many Americans Have Nothing Saved for Retirement? It’s sad but true. Millions of Americans are more focused on paying their bills, many living paycheck to paycheck, and not even remotely considering saving for retirement. If you are one of these people, just know that you are not alone. According to an article from CNBC, most Americans have under $1,000 saved for retirement and half of all Americans have absolutely nothing at all saved — including those who COULD be saving in IRAs and 401(k)s through their employer. A 2016 survey from GOBankingRates showed that 35 percent of all adults in the United States have only several hundred dollars in their savings accounts and 34 percent have absolutely no savings. The chart below shows the breakdown of these numbers. Older workers who are extremely close to retirement can’t even handle the possibility of being without an income. The Economic Policy Institute notes that the median savings for families whose wage earners are between 50 and 55 years old is only $8,000 and for those between 56 and 61 years old, it’s only $17,000. Unbelievable, people. Don’t be a part of the growing number of Americans coming to regret this reality. 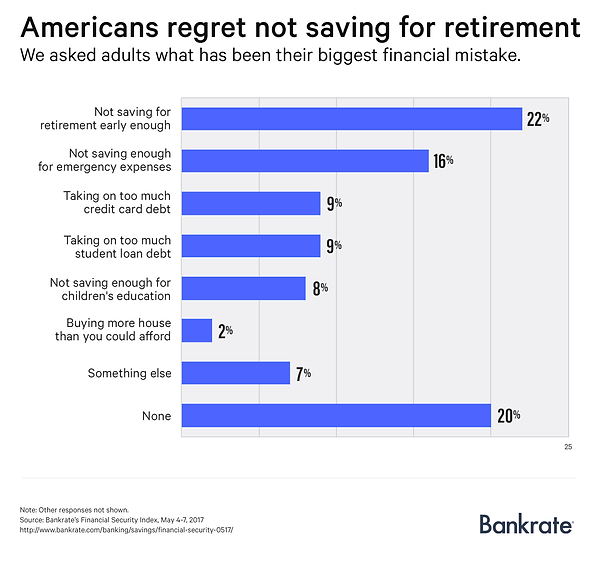 A whopping 46 percent (almost half) of all American adults say their biggest money regret is not saving for ANYTHING in life, 22% regret not saving enough for retirement. Compare this to 9% who regret taking on too much student loans and 8% as not saving enough for their child’s education. This chart from Bankrate shows the breakdown. Today only about 13% of Americans have a pension waiting for them at retirement. Compare this to 38% of workers 25 years ago. The 401(k) plan was meant to be a solution to this by encouraging employees to save, yet overall few have truly taken advantage of this. Natixis notes that actually 24% of the baby boomer population expect that their children will play a role in funding their retirement. No word on how the famously poor and lazy Millennials will help with that massive bill. The lesson here — THINK about retirement NOW. Do not keep putting it off.